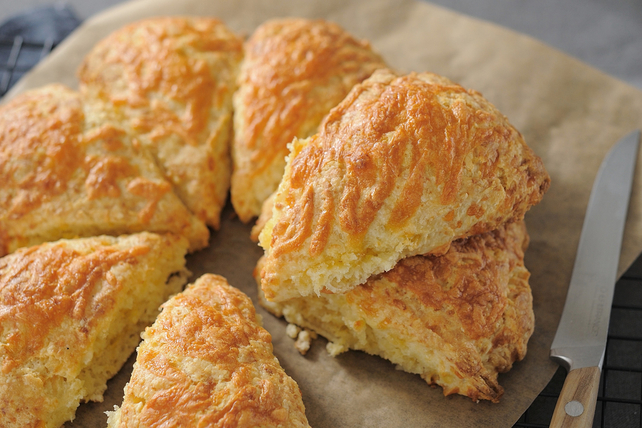 This Sharp Cheddar Scones recipe is quick and easy to make. No one will be able to resist these cheesy scones when they've just come out of the oven. Try serving them with a hot bowl of soup or stew. Combine flour, baking powder and salt in large bowl. Cut in butter with pastry blender or 2 knives until mixture resembles coarse crumbs. Add 3/4 cup milk and egg; stir just until mixture forms soft dough. Stir in half the cheese. Divide dough in half. Roll out one piece into 7-inch round on lightly floured cutting board; cut into 8 wedges. Place, 1 inch apart, on baking sheet sprayed with cooking spray. Repeat with remaining dough on second baking sheet. Brush with remaining milk; sprinkle with cheese. Bake 25 min. or until golden brown. These easy-to-make scones are equally delicious whether served warm or cooled to room temperature. For easy cleanup, cover baking sheets with parchment instead of spraying them with cooking spray.